Windows, for example Windows Vista and Windows 7, (for those with hardware supports Windows Aero) features Flip 3D, a 3D windows management system that uses the dimension of visual depth by rendering images of live processes to provide a more comprehensive view of open windows. 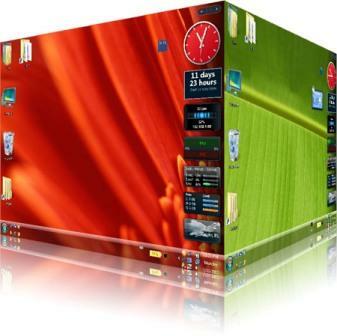 However, almost all Windows Vista and Windows 7 computer comes with this 3D task switching function, and your system is of nothing unique. Yod’m 3D will make it different. 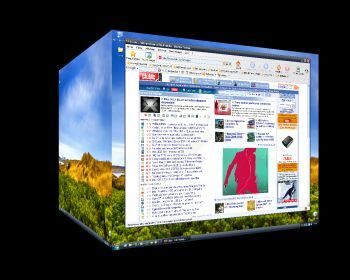 Yod’m 3D (Yet anOther Desktop Manager 3D) is a virtual desktop manager with 3D switch similar to Flip 3D which provides 4 virtual desktops, and render in the effect of cube style, just as the effect of user switching in Mac OS X.
Yod’m 3D works in Windows 2000, XP, Vista and 7, and it requires DirectX 9.0, and plenty of memory. CTRL+SHIFT+Left/Right = Swith to next or previous desktop. 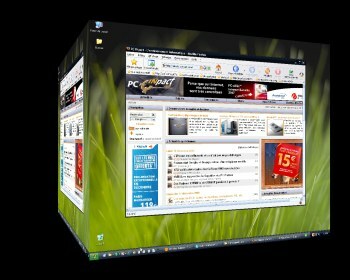 CTRL+SHIFT+Up = Activate Yod’m 3D and show a “far” or “wide-angle” view of the current desktop, and then press Left or Right to select turn the desktop cube. CTRL+SHIFT+Down = Activate and show a “near” or “tele-photo” view of the current desktop, and then press Left or Right to switch rotate the desktop. Hold down CTRL+SHIFT to use the mouse to turn and rotate the cube horizontally. Use the scroll wheel to zoom in or out. Click and hold on the title bar of the window (not maximized if possible). Press and hold on CTRL+SHIFT keys to activate the Yod’m 3D cube. When the cube is activated, move the window to the left or right. The wallpaper of each desktop (total of 4 virtual desktops available) can be changed by using Display Settings of Windows Vista or Windows XP. Click on the Yod’m 3D icon in the Taskbar, the list of the windows opened in other desktop appear. Then click on the application to switch to the desktop instantly. Scroll arrow at the dockbar to manage shortcut icon. Transparent color for the title. Progress bar for thumbnails of copy, download and the loading of Internet explorer’s pages. Management of windows screenshot will avoid waiting for hanged application. Wallpaper for each virtual desktop. Notification message if an application “flash” in the Taskbar of another desktop. List of the windows of other virtual desktop in the menu accessible by clicking on Taskbar icon. If you’re not convinced enough how pretty the cube effect is, here is another screenshot of virtual desktop switching with Yod’m 3D in close up view.